The Texas heat and sun creates uncomfortable conditions for outdoor enjoyment on the patio. A well-built patio cover and the addition of ceiling fans, rated for exterior use, provide both shelter and comfort from the heat and sun. It’s great to have a nice, shady spot to just sit and relax after a long, exhausting day. Your existing patio deserves a little pick-me-up after years of service to your family. A covered patio offers many options for outdoor entertainment. Add extra chairs and a picnic table to host several friends for a birthday party, or keep it simple and romantic with a small bistro set for two. 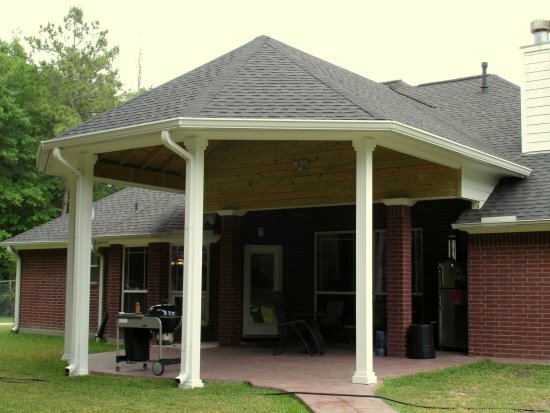 Whatever your reasons for building a patio cover, Texas Decks is here to help make that vision a reality. No More Cancelled Cookouts: How many times have you had to cancel a cookout with friends because of a little rain storm? A patio cover will help dramatically reduce the number of cookouts you have to cancel or move indoors because of the Texas heat and humidity. Of course some great Texas storms come with a billowing wind, so not all cookouts can be saved by a patio cover alone. Sturdy Construction: Texans are no strangers to serious storms. A patio cover must be well-built to withstand our bad weather and not blow away like a premade kit. We build our custom patio covers using high quality materials to ensure a sturdy finished product. Which is further enhanced by having an engineer stamp and seal all drawings before construction begins. Protection from the Elements: Rain, wind, and the sun often create uncomfortable conditions. A patio cover allows you to continue to enjoy your patio during gentle rain, wind, and on hot, sunny days. Protect Patio Furniture: Patio furniture often becomes brittle or discolored due to the sun and other weather conditions. Maintain that like-new appearance of your patio furniture without having to put it away or cover it during periods of nonuse. Increase Your Home’s Aesthetic Value: Let’s face it, a well-built and nicely designed patio cover just looks great. It will go a long way in increasing the aesthetic value of your home as well as keep your patio from becoming discolored by the elements. Consider staining or painting the wood a color that complements your home’s existing colors to complete the look. When you hire Texas Decks to build a patio cover for you, you’re hiring a long time Texan with years of experience building in Texas. My team of experienced builders enjoys the challenges today’s homeowners place in our path. We gladly step up to the challenge, offering our expertise as you describe your ideal patio cover to us. Together, we will create the patio cover you want. Contact me at any time to discuss your project, or to bounce ideas. I don’t have a project manager to keep up with my projects, I do that all myself. You will not deal with a middle man during any phase of the project, because there is no middle man. I personally oversee every aspect of each of my projects and am always available to answer questions whether face to face, by phone or email if our schedules don’t allow for time for us to meet. Before you go, if you would like to see some of the patio covers we have previously built check out our gallery of past projects here. If you’d like to see what some of our clients have to say about us, click here. If you would like to speak to me directly, call 281.960.2061 or contact us through our website by clicking here.